The last year for singleshots, this brilliant and flashy 1969 Nishijin delivers the eye appeal so typical of that era. 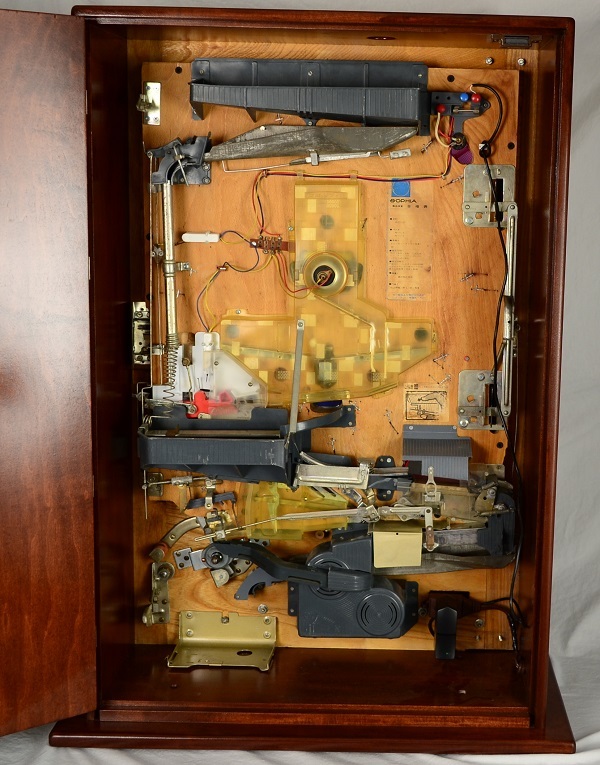 This machine was nearly destroyed when found, and it recieved a complete overhaul in every way. 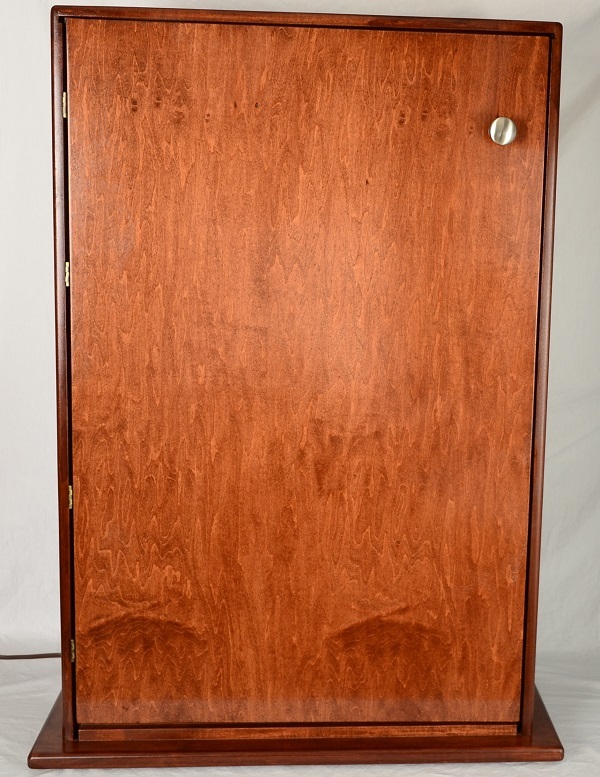 This one has been custom built into a solid maple cabinet and stained to a pleasing mahogany. It is fully functioning mechanically and although power is not required, the lights has been modified to run on a 12VDC power adapter and do function perfectly. 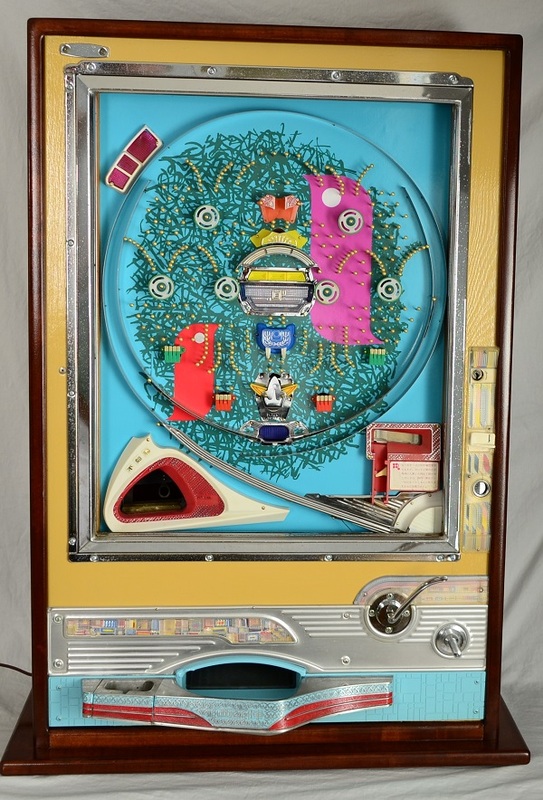 This Pachinko Machine was carefully and completely disassembled and all pachinko ball pathways and parts (plastic and metal) were cleaned thoroughly. The case and front trays were also similarly cleaned. The playfield graphic was removed and replaced with a bright new reproduction on vinyl with a 3mil UV protecting glossy laminate. The front chrome frame shows light "sparkling" from removed rust damage, but does shine and display nicely. The jackpot lever axle was carefully polished smooth, cleaned and pivots easily under its own weight. The see saw (jackpot actuator) and all moving parts move freely and function like original. This machine pays out jackpots reliably with the soft, pleasant ringing of the bell. This beautiful machine would make a fine addition to any gameroom, or even to display at place of business. The unique qualities of these restored machines never fail to spark interest in anyone who sees them. This machine is not a rusted and dirty pile of parts that you find on ebay from someone's garage. It is a showpiece, and you cannot find anything like it anywhere else. 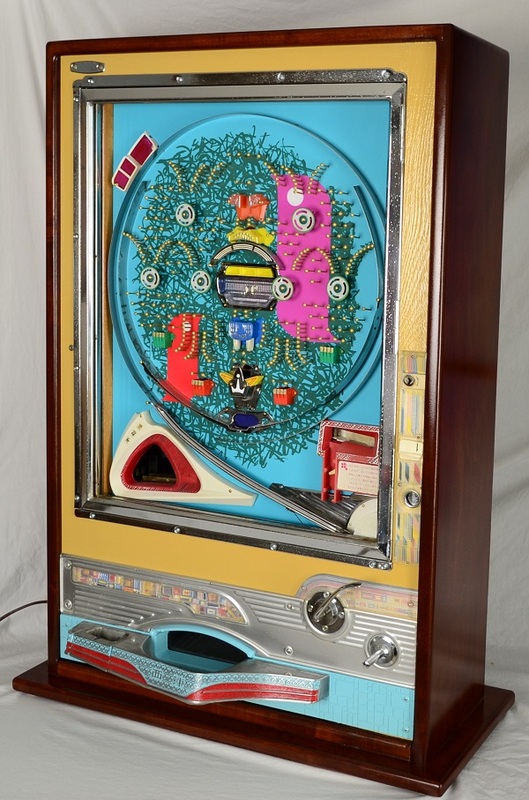 This machine can be a little finicky, and is not recommended for someone looking for a game to play on a consistant manner unless they are well informed about the mechanics. It should be purchased primarily for display purposes. The machine also includes: 500 brilliant rust free pachinko balls. It does not include a key, but the front can be opened by means of the panel access lever in the back of the machine.